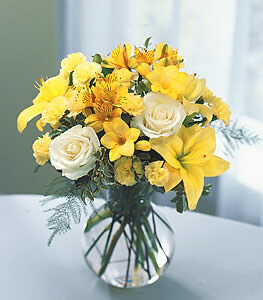 Two luscious white roses are encompassed by sunny Asiatic lilies, yellow mini carnations, freesia, and alstroemeria. Sure to bring delighted smiles along with your best wishes. I will use you again because you chose to take care of your customer.